Bates Woodwork is available to install many different coverings to the outside of your home. 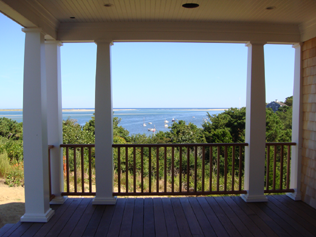 We also can arrange special designs so that you can show any of your interests, or your love for all things Cape Cod. 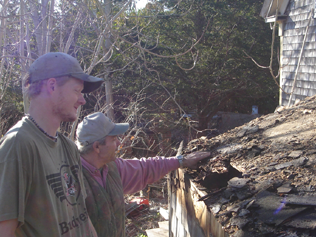 Bates Woodwork can install Cedar or Asphalt shingles. As well as arranging for rubber or copper roofing and flashing where applicable and neccessary. We make sure that every step is taken to ensure maximum waterproofing. We can also fix the situation if a previous contractor has failed to do so. Bates Woodwork can build your new deck, or repair your old deck with the material of your choice. From beautiful naturally durable woods like Mahogany and Ipe, to composite materials such as Trex, and CorrectDeck. 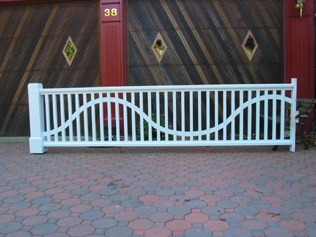 We can also integrate your personality and interests, like we did with the Wave Railing pictured above. 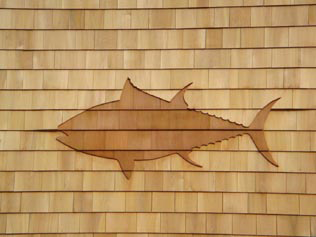 Bates Woodwork has done some out of the ordinary designs, and can create the look for your home to make it stand out. See our Tapered Columns gallery, that is soon to be featured in The Journal of Light Construction.